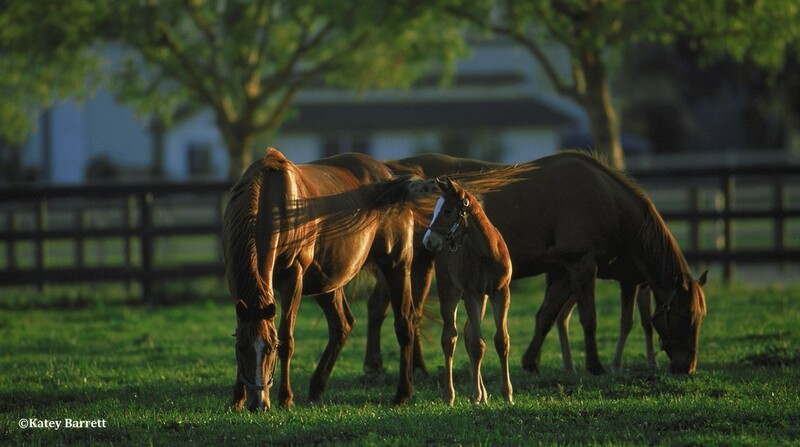 The term “farm” in the world of thoroughbred horse racing, generally means a facility (well out into the country) where horses are sent to rest, recover, be bred or broken, give birth or simply grow up. The farm’s value lies principally in two qualities: first, plenty of space (and space in plenty of varieties, from small stalls to outdoor pens to fields) – and second, a daily maintenance fee much lower than the one you’re paying at your trainer’s racetrack barn. Every farm is slightly different. Some offer stallions standing at stud and breeding barns, some don’t. Some have foaling barns for pregnant mares (often complete with closed-circuit cameras to monitor the mare as she nears delivery) – and some don’t. Some offer expert breaking and preliminary training for yearlings. (These have their own, padded “round pens” for breaking, will gallop the horse under full track for 60-90 days to condition it for advanced training at the racetrack, and may even school the horse to the van and the starting gate). Mainly, the reason for the existence of farms is the four “R’s:” Rest, Recuperation, Recreation and Re-Training. Sending your equine friend to a farm is the equivalent of sending a human friend to the Golden Door (but much cheaper). Virtually, all farms have stalls for “lay-up” (meaning time in confinement and under close supervision for the treatment and healing of injuries, surgery and difficult illnesses). Likewise, most farms offer the following: a consulting veterinarian (though you may specify your own vet if he or she is willing to travel to farms); rehabilitation treatments such as treadmills or swimming pools (aqua-therapy keeps the horse in condition without putting weight on the legs and back); larger outdoor sand paddocks and rail pens for gradual rehabilitation; re-training personnel and facilities (including exercise riders, hot-walkers, possibly massagers and chiropractors, and experienced trainers), and properly maintained oval tracks for galloping and breezing. Finally, there are large, grassy “turn-out” pastures that give mares and their foals, mares in foal, weanlings, yearlings, horses on a slow mend – and those who, from soreness of body or spirit, need “freshening” – a chance to roll in the grass and cavort, a vacation from the noise and confinement of barn life and the stresses of racing. Apart from their specialties, all farms exist for one primary reason: thoroughbred racehorses are physically fragile creatures and are susceptible to many kinds of injuries and ailments. Most are vulnerable in their backs, their respiratory systems, their stomachs, and especially in their front legs – delicate, spindly affairs which must often support more than a thousand pounds at thundering speeds. It is safe to say that all racing horses will need to spend some (or a lot of) time recovering at farms during their careers. It’s up to the owner and trainer to choose which farm will best serve both needs and budget in any given case (prices, staffing and equipment vary quite a bit). Ideally, before choosing, you should tour the farm in person to see how well the horses are “known” by the personnel (i.e., how carefully they’re being attended and watched) and to observe the quality of feed, grooming and conditioning. The degree of commitment at a farm can quite literally determine the racing future of your horse. These prices generally include all feed, grooming, icing, bandages, exercising, bathing, hot-walking and Worker’s Compensation insurance. However, as with the racetrack training barns, all veterinarian services, medications and x-rays are charged separately – except, usually, for the practice called “blistering.”* Also, aqua-therapy (swimming, etc.) may be extra, and a special vitamin supplement may cost a bit extra (perhaps $1.00 per day). *”Blistering” means applying to the horse’s front legs a vesicant, or inflammatory liniment. Because a horse has no muscle (and therefore poor circulation) below the knee, and since this is where many of its injuries occur, the liniment is designed to increase blood flow to the area. Blistering is temporarily uncomfortable for the horse, but not damaging.